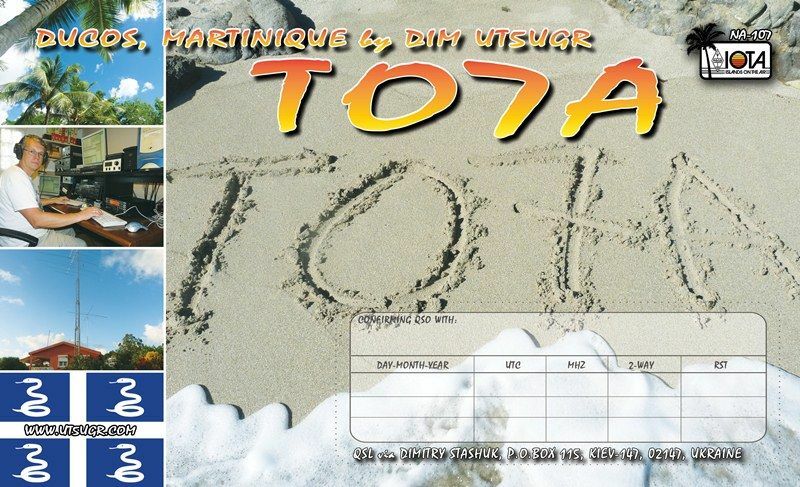 UT5UGR will be active from Martinique Island in CQ WW DX CW Contest 29 - 30 November 2014 as TO7A. 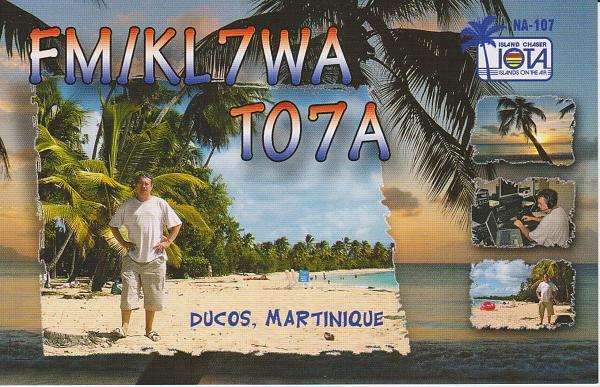 Outside the contest he will be active as FM/KL7WA. Martinique is an Island located in the lesser Antilles, right in the eastern part of the Caribbean sea. The Island has a population of less than 400,000 as at January , 2013. Martinique is an oversea region of France, and it is a windward Island located north of Saint Lucia, south of Dominica and Northwestern region of Barbados. Martinique remains one of the 27 French regions in the world, it remains part of the European Union and the Euro is the main currency spent here. The official language spoken on the Island is French, however a significant portion of the populace speak Antillean Creole. Martinique has several nicknames and one of such is “Island of flowers”. The Amerindian inhabitants, who migrated from Cuba and some Hispanic countries, were the first to occupy Martinique in the early 14th and 15th centuries. The French occupants however occupied the Island in the 17th century creating numerous African slave societies. Martinique is located some 450 Kilometers off the South American coast, and has a total land area of 1,100 sq. Kilometers. Martinique remains the third largest Island among the lesser Antilles region, and Mont Pelé is the highest point on the Island, reaching a height of 1,397 meters above the sea level. The Martinique Island lies on the Volcanic region of the North American plate which is located on sub-duction fault line. There are presently 8 active volcanic mountains and hills on the Island. In the year 1902, a major volcanic eruption occurred in the capital city of Saint Pierre and this resulted in the relocation of the capital to Fort-de-France and the city remains the capital until this day. The Andesitic lavas form the oldest rocks in Martinique to this day, and the Island has a huge mineral deposit of Magnesium and Iron. Martinique’s peninsula of Caravelle is the port separating main North Atlantic and South Atlantic. Martinique is characterized by the Black sandy beaches of the North and the white sandy beaches of the south. Martinique is characterized by tropical warm climate with several months of rainfall. The Island is heavily forested and it is a good source of premium woods such as Mahogany, and rosewood. Tropical and humid climates are characteristics of the climatic conditions of the Island with temperature normally ranging from 24 and 30 degree Celsius. The temperatures on the Island are moderated by the Trade wind. The raining season here is between June and October and the region is susceptible to cyclones on every 8 years on the average. Summer months are between July and August while most tourists prefer to visit the Island between December and August of every year. The Martinique population speaks predominantly French language than any other region of the Caribbean Islands, The population of the Island as at January 2013 was about 390,000, and with less than 1% annual population growth. Less than half of the populations of the Island speak the Creole language. The Bekes are the white-skin descendants of the original white occupiers of Martinique. These groups make up the local elites of the Island. Though the Bekes constitute the minority of the population, however they are economically wealthier than the dark skinned population. The Metros are the French people from France and these are considered as outsiders by the local Martinique people. The Metros are the ones who hold key positions in Government, education and civil service. It is quite common to see inter-marriage between Metros and Bekes in Martinique. 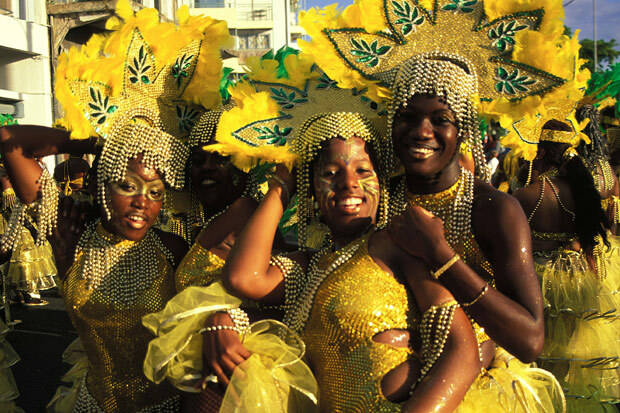 The culture of the people of Martinique comprises of a blend of French and Caribbean culture. The people of the Island often enjoy lengthy lunch and that is why most businesses close at midday. Aside from the French and Creole languages, English, Spanish and Portuguese languages are also common. Mixed African languages such as Mauritian languages are spoken by very few minorities. Being a French colony, Martinique is regarded as part of the European Union, therefore EU citizens may not require a visa to visit the Island, however other countries of Asia, South, America and Africa may require visas. Martinique Island can be accessed by airplane and boats. Air Caraibes and Air France offer twice weekly round trip to Martinique, and the Island can be accessed from the Caribbean from Air Caraibes and Air Antilles express that also offer round trips. There are several other airlines that offer round trips from Germany via Paris, or from USA, Puerto Rico and Canada. There are quite a number of ferry companies operating from neighbouring Islands , these include ; Express de lles, and Brudey Frères. Cruise ships make use of the harbour at Fort des France. There are limited public transports in Martinique, however you can hire taxis for a token fee. • Hitchhiking is one of the most prominent activities on Martinique, however you need to take lots of water with you and don’t stay too long in the sun. Hitchhiking offers lots of fun and a wonderful way to know most places within the Island. • Beaches- there are lots of clean beaches in Martinique, and you can have some splash in the clean water or engage in some water sport activities. • Steak and fries- most restaurants in Martinique offer steaks and fries alongside a fine blend of French and Creole cuisines, that include lots of hot pepper. • The open air markets- these markets provide lots of fruits and vegetables, including Banana, Pineapples, Breadfruit , yams, and Cabbage. •Sea foods and shellfish- most Martinique cuisines include lots of sea foods including; Lambi (conch), Octopus and salted Cod. • Blaff- this is a special sea food that contains boiled fish served with Chives. • Court-Bouillon- This is the national food in Martinique and it comprises of fish served in hot Tomato sauce. • The Calalou- this is a special dish containing salted meat with soup and crab.